Almost immediately after Valentine's Day I started getting messages from weelicious readers asking me for St Patricks Day recipes. While it would be simple to squeeze a few drops of green food coloring into a bunch of recipes, I avoid food dyes as I think they are dangerous. I made the decision to come up a weeks worth of festive, green, dye-free St Patty's Day recipes that you can feel good about feeding your family. 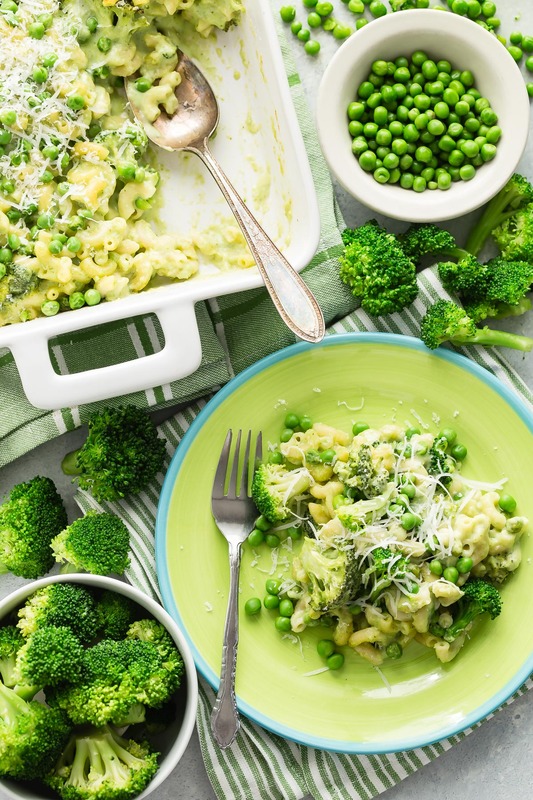 Since every kid I know seems to love mac and cheese, I wondered how I could bring some verdant color to this classic dish. Offering kids green takes some creativity. While some have no issue eating green foods there are plenty who do. Kenya happens to be a great eater, but he took one look at this green mac and cheese and instantly said no. Chloe, on the other hand, managed to be on her third serving while he and I continued to discuss why he wouldn't even try it. Never wanting to push, I told Kenya it was fine with me if he didn't want to eat it. As time passed he started to eyeball me as if he wanted to eat it, however I could sense that he couldn't back down from his original defiant declaration. Kids can instinctively say no to new foods they aren't used to -- a lot of it has to do with their comfort level, and you need to work around that. My solution was offering to grate a little more cheese on top for Kenya and he was finally game to try my new recipe (sometimes I think I could grate cheese on an old shoe and that child would eat it). Two servings later I got the feeling Kenya was very happy with his decision and I was thrilled that it ended as a win for the both of us. 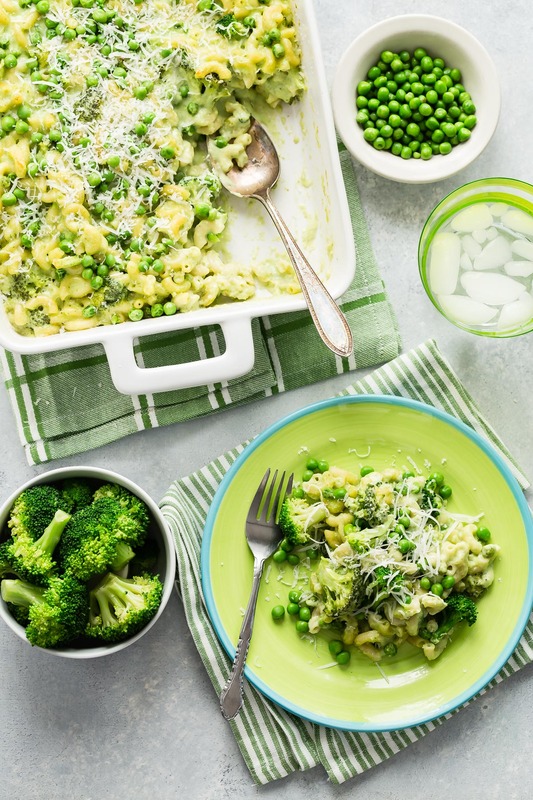 This mac and cheese is not only super creamy and cheesy, it's packed with nutritious veggies like spinach, broccoli and sweet peas which only add to the heavenly nature of this traditional, kid friendly recipe. See, it's easy being green! 2. Cook pasta in salted water for about 3 minutes less than package directions call for, until al dente. Reserve half a cup of the pasta water and strain. 3. While the pasta is cooking. Place the milk and spinach in a blender and blend on high speed until smooth. 4. In a large pot melt the butter and then add the flour, whisking continuously over low-medium heat for 2-3 minutes to make a roux. Slowly whisk in the milk mixture and bring to a boil. 5. Reduce heat and simmer, whisking occasionally, 3 to 4 minutes, or until sauce is gently bubbling and starting to thicken. 6. Add reserved pasta water and cheese and whisk until melted. Stir in the pasta, salt, broccoli and peas. 7. Transfer to a greased 13″ x 9″ baking dish and bake for 20 minutes, or until cheese is bubbling and the pasta is set. Can this be done with whole wheat macaroni or partial whole wheat like Barilla Plus? Or not reccommended? Any type of short macaroni pasta should work! Can I omit the spinach? The recipe sounds yummy but i don't have any spinach on hand. Thanks! I just like the valuable info you provide in your articles. I will bookmark your weblog and take a look at again here frequently. I am somewhat certain I will be told many new stuff proper right here! Best of luck for the following! How could I turn these to muffins? Can I just bake for 20 min like the mac chicken and cheese muffins? My picky eater will only eat in muffin form! Have since made this adding fried onions and garlic at the beginning and topping it with a mixture of grated cheese and breadcrumbs before placing in the oven - even more yummy! Hi. I was just wondering if anyone has tried this with skim milk or 1%? Thanks. Hi. I did my with Almond Milk is was very good also. My grand kids love my chicken noodle soup. They will request it often. Awesome blog! Thank you for your wonderful, healthy recipes! I used to HATE pancakes grwiong up! Now, I love them. I haven't tried them with cottage cheese but it definitely looks delish, gonna have to tr it out!And duh, Cooper is adorbs! Saw your segment on The Chew, and had to come by and say hello. I had a quick question about this recipe. Did you ever test it with any other veggies, or do you have another version that you know works well? I would really like to eat it as is, but being on blood thinners, a spike in my Vitamin K intake is forbidden, which means I can't have all the delicious leafy green veggies. I still would like to make it healthy, but not sure what other veggies may work with it,. Have you ever tried zucchini or squash? I wonder if they would release too much moisture and ruin the dish? Any suggestions or extras you have would be much appreciated. Thanks so much! I haven't tried this specific recipe with other veggies, but I agree with you about the squash releasing too much liquid. I think you could use any sort of firm veggie: peas, corn, carrots (would blanch first), bell peppers (maybe a quick saute first), cauliflower, etc! Let me know what you try and how it comes out! I was wondering if I could replace the spinach with bok choy? I bought some on a whim and not really sure how to cook with it! Thanks! Made this yesterday and there are no kids @ my house great way to get in more veggies thanks for recipe Husband loved also. can't wait to try the green mac &amp; cheese! Hi Catherine, I also saw you on the Chew, and I think I'm a new fan! Thank you for sharing your talent with the rest of us. I do have a question. You mentioned that you make large portions so you can freeze and defrost later. Do you freeze them in blocks? How do you defrost and reheat a dish like this one? Is there a section on this blog where you share with us all your little tricks and your must-haves? Thank you so much for answering! Thanks so much for coming to visit! making this tonight! i've been wanting to ever since i saw you on the Chew, but i love all your recipes! they've all been a great success! Great way to sneak in those green veggies. My lil girl does not like pasta very much but loves her veggies..
What other white cheeses can be substituted for white cheddar? I have the exact same question, I have shredded mozzarella at home, I wonder if it would come out just as good.. I want to make this, but want to add some ground turkey or chicken to it, too. Catherine, how would you do that? Cook it with seasonings, then add to dish prior to cooking, or...? Yes, cook it first with a tiny bit of seasoning, then mix in just before baking! you. mention pass and broccoli, when did you add. then? Do you think I could blend the brocoli and peas with the milk &amp; spinach? My girl is refusing all veggies at the moment in whole form, but loves green smoothies, so I think she'll be ok if there are no whole pieces. What do you think? 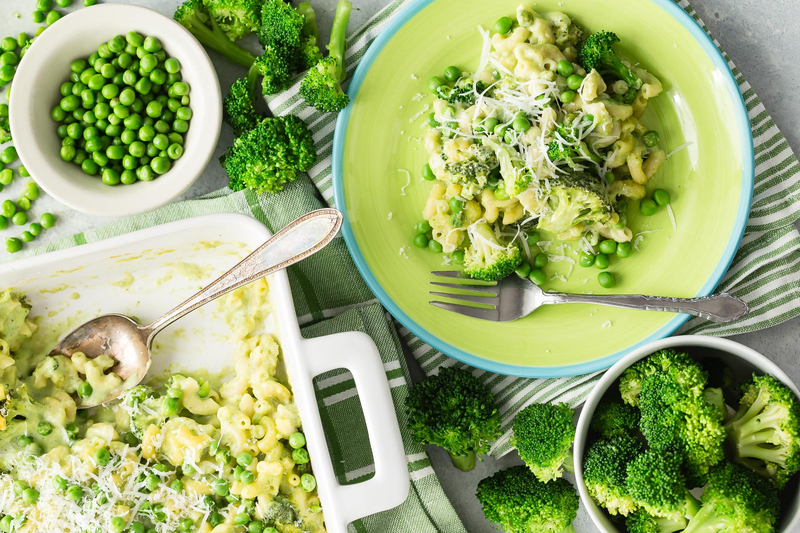 Can you use frozen broccoli and frozen peas? And fresh kale? My kids loved this recipe! I thought it was good, but would like more flavor. I may try some of the suggestions that others have made with onions or garlic just to give it a little more flavor. A great way to get the veggies in kid friendly meal! 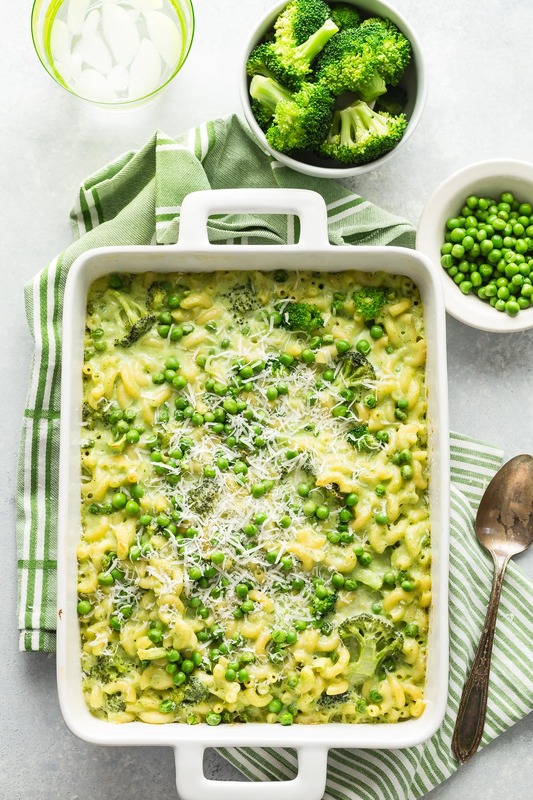 I made this green Mac and cheese recipe for dinner last night for St. Patrick's day. It is SO delicious - and easy. We are a family of three so I made 1/2 the recipe. Next time I will make the full recipe and freeze 1/2 for a future dinner. I followed other reviewers suggestions and added garlic powder, dry mustard and a little paprika. I also tossed a little mozzarella and parmesan on top before baking. Highly recommend, everyone loved it. This looks great! Can't wait to try it. Since this makes so much, do you think it would freeze well? I think it would freeze great! When ready to eat it, thaw overnight in the fridge and reheat in the microwave or 350F oven! Wendy Self Care Coordinator The Dorset ME Support Group (registered charity).